John Wayne made 187 films during his career. Or maybe it was 200. Or it could have been as many as 250. The fact of the matter is that we may never know everything about John Wayne’s work in the movies. The generally accepted notion is that his career began in 1926 at Fox studios when he met famed director John Ford. However, there is significant evidence that it began long before this, and that it involved many more films than are usually quoted. For the purpose of this article, “work” is defined as prop work, walk-ons, extra work, stunts and roles, whether credited on screen or not. The movies are not much older than John Wayne who was born in 1907. The Great Train Robbery, first shown in 1903, is considered to be the beginning of movies as we know them today. 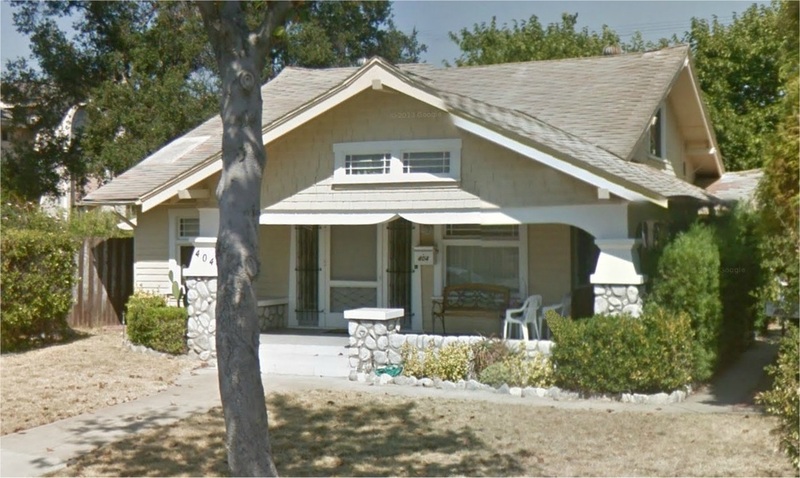 Around the same time as the young John Wayne and his family were settling into Glendale California, the movie makers were also heading to California, and it is more than likely that it was here and at this time that John Wayne’s movie work began. 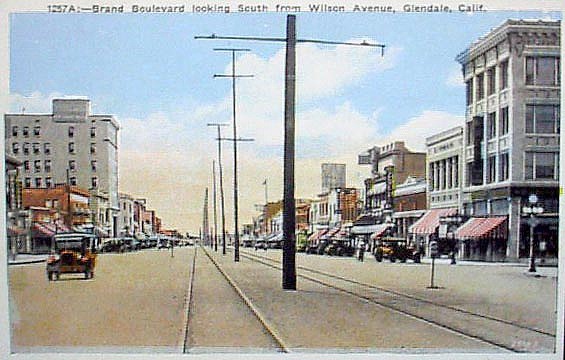 Glendale c.1915, as the young John Wayne would have seen it upon his families arrival there in 1915. 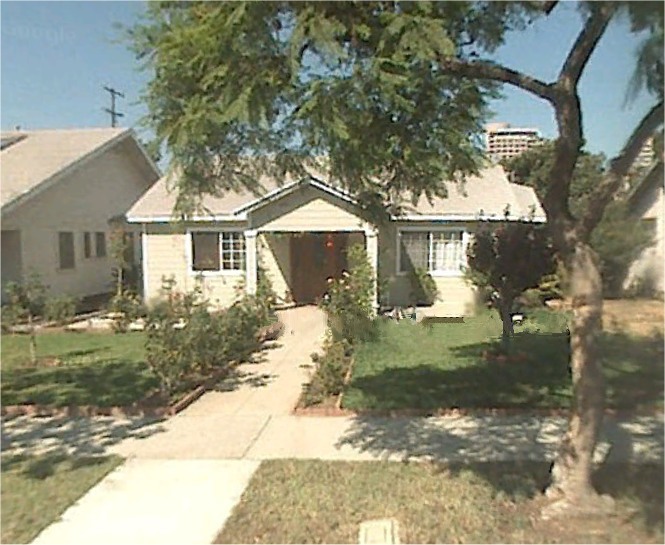 During the time period that the young John Wayne spent in Glendale, there were several Hollywood and New York Movie Studios that had relocated there, and many who had found the surrounding Verdugo Hills ideal for filmmaking. 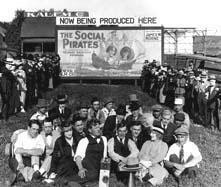 The young Wayne soon became enamored with the movie making folks and he spent as much time as he could around them. Here are just a few of the many references regarding movie studios located in, or filming around Glendale at this time. 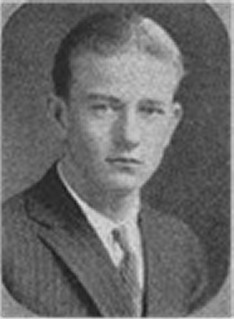 That the young John Wayne, or Duke Morrison as he was then known, was involved at least to some degree with Hollywood film making during his pre-USC days should not be in doubt. Here are just a few of the many documented references regarding that film work that John Wayne did at the movie studios located in, or filming around Glendale at this time. From these documented references, it is clear that the young John Wayne (then known as Duke Morrison) was intimately familiar with films, and had done at least some work on an undetermined number of them. Although this work was likely behind the scenes as a member of the crew, the fact remains that he did work on films from that time, and the possibility exists that he may even have appeared on screen as an uncredited extra in some of them. 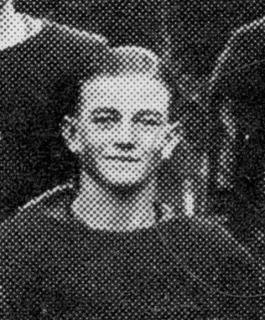 To date, John Wayne’s earliest known appearance on screen (as validated by his on screen appearance) is in the 1926 Lloyd Hamilton comedy short,(24) Careful please. 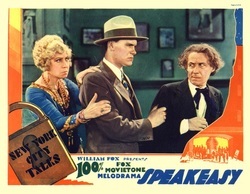 The discovery that he did appear in this short comedy meshes with Wayne’s later statement that John Ford asked Lloyd “Ham” Hamilton to put him in front of the camera in bit parts in some of Hamilton’s films. The speculation as to which movies he was involved with in the preceding and following years, right up until the release of Stagecoach in 1939, continues to this day. Some of the reasons for this can be explained by the fact that many of the written and recorded biographies of John Wayne, were mostly created decades after this period when memories were not as sharp as they once were,and even John Wayne himself said he could not remember all of the films he was involved in! Also the research for these biographies is inconsistent and has led to many contradictions which are quoted ad infinitum as being “definitive”. The doubt about John Wayne’s involvement in this particular film centered largely around when Lloyd “Ham” Hamilton, John Ford and John Wayne met. 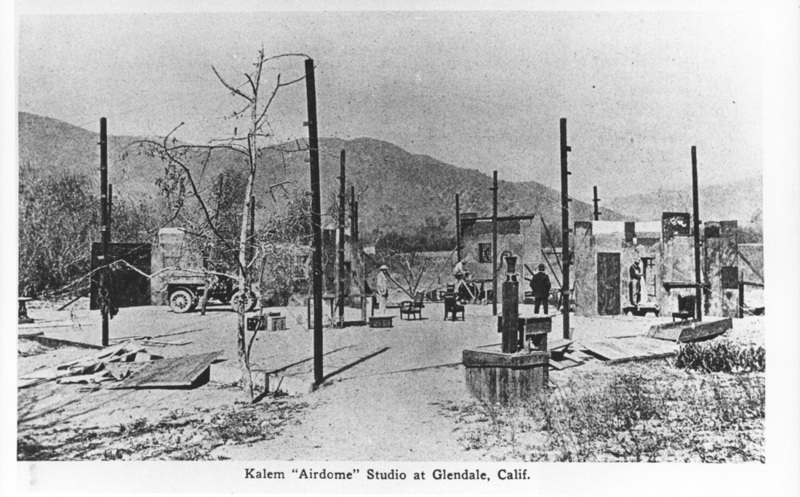 Even ignoring the fact that Hamilton worked at Kalem who had studios in Glendale, Ford worked for Fox who filmed around Glendale and a young John Wayne had a keen interest, perhaps minor involvement in movies at this time, and that they therefore could have stumbled over each other. There is evidence showing that all three of these men could have been in the same place and at the same time, as early as 1925. 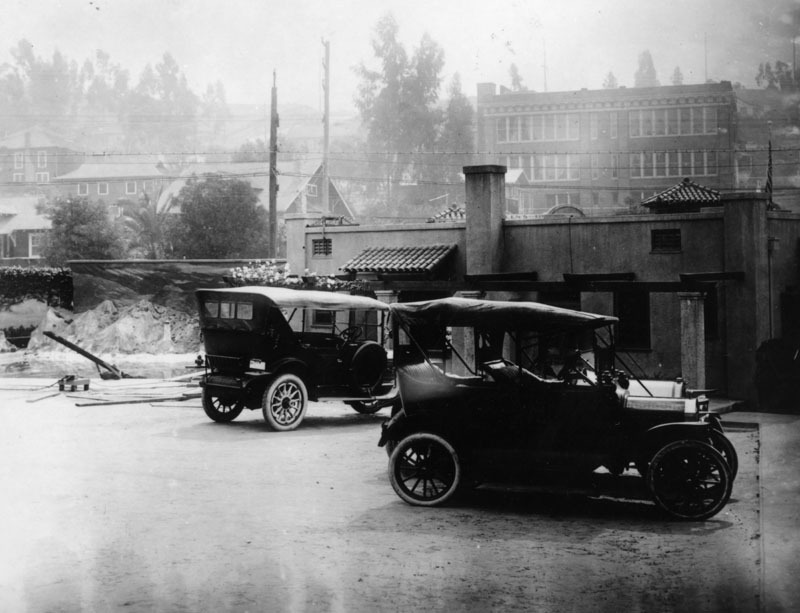 Also taken into account is the fact that although Ford allegedly met Wayne for the first time in 1926 while on the Fox studio lot, and cast him in Mother Machree (which began filming in September 1926), it is know that Wayne had been on the Fox lot prior to this. It is also difficult to imagine that while Ford was so impressed with Wayne’s naturalness in front of the camera that he cast him in Mother Machree, but then did not use Wayne again until almost two years later in Four Sons. 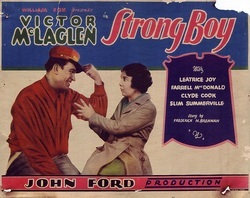 Between 1926 and the February 1928 release of Four Sons, it is known that Ford made at least four other films: The Shamrock Handicap (released May 1926), 3 Bad Men (released August 1926), The Blue Eagle (released September 1926) and Upstream (released January 1927). [Note: Ford likely spent the remainder of 1927 working on Mother Machree, which was finally released in London in September 1927, and in the United States in January 1928]. With these huge gaps between film projects, coupled with the very few days of extra work on the five films Wayne did during this time for MGM, Fox and First National, one would naturally question whether Wayne did any other work for Ford during this time frame. The answer to that question would be yes. 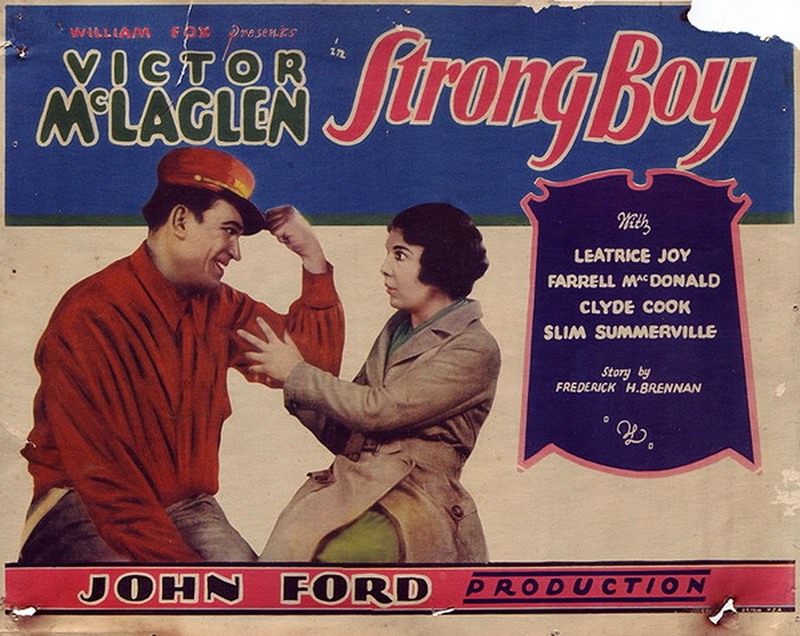 With the discovery of a young John Wayne in a crowd scene near the end of Ford’s 1926 film The Shamrock Handicap (released 2 May 1926), it is now known that their first collaboration was not Mother Machree as originally thought. Of course this also begs the question of just how many other films did the young John Wayne work on during this time period. After all if John Wayne in person and or his name, can be seen on screen then who can argue that he was not involved or not credited? Sources often say John Wayne was “billed” or “credited” (or not). Billing and credit is explained here for clarification. Billing is a performing arts term used in referring to the order and other aspects of how Credits (the list of actors and behind-the-scenes staff who contributed to the production) are presented in films and other creative works. Information given in billing usually consists of the companies, actors, directors, producers and other crew members. 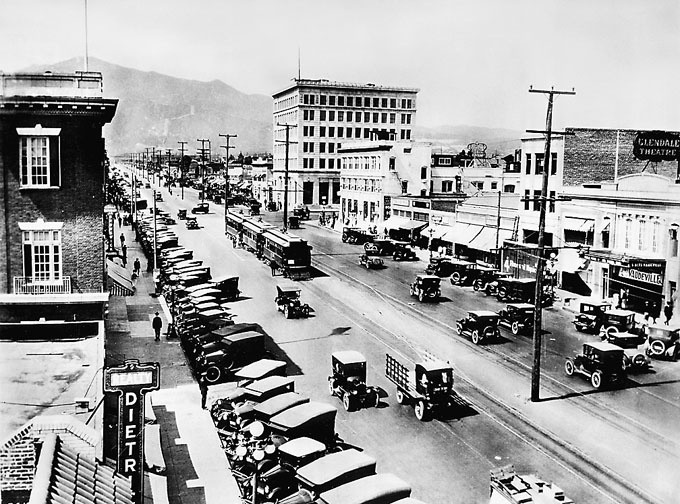 From the beginning of motion pictures in the 1900s to the early 1920s, the moguls that owned or managed big film studios did not want to bill the actors appearing in their films because they did not want to recreate the star system that was very prominent on Broadway at that time. They also feared that, once actors were billed on film, they would be more popular and would seek sky-high salaries. In 1910 Florence Lawrence previously only known to the general public as the "Biograph girl", was lured away from Biograph by Carl Laemmle for his new Independent motion picture company (IMP). 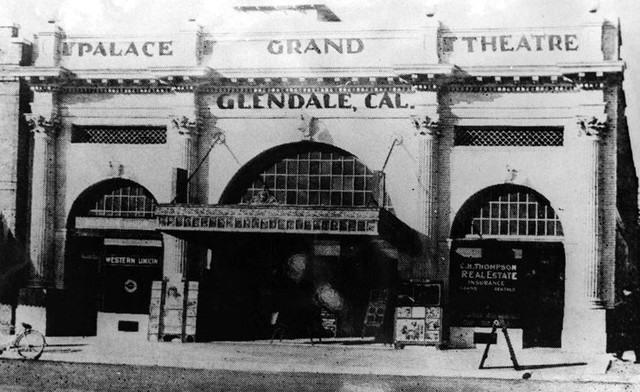 Laemmle offered her more money and marquee billing, something Biograph did not allow at the time. 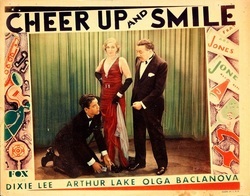 She became the first film star to receive billing on the credits of her film. From then on, actors received billing on film. Also originating during that time was the system of billing above and below the title, to delineate the status of the players. 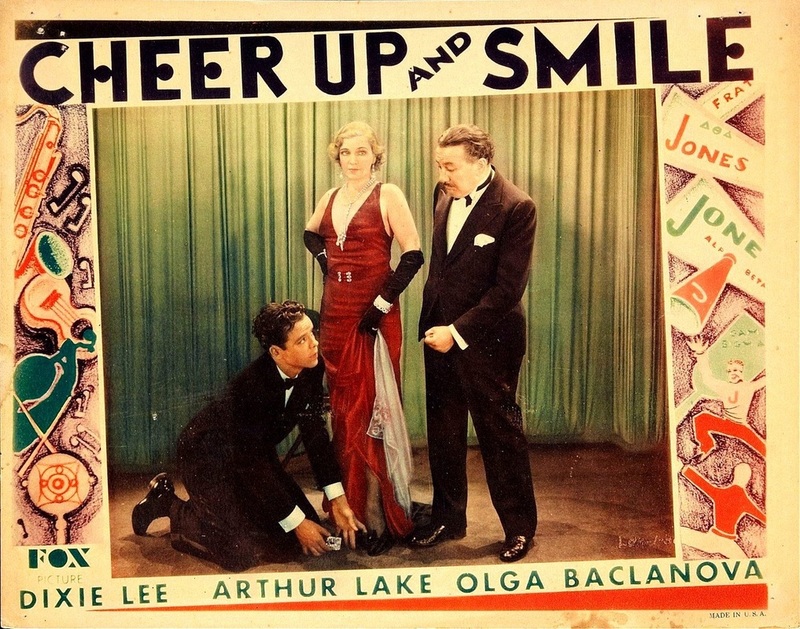 Big stars such as Pickford, Fairbanks, and Chaplin were billed above the title, while lesser movie stars and supporting players were billed below the title. During the era of the studio system, on-screen billing was presented at the beginning of a film; only a restatement of the cast and possibly additional players appeared at the end, because the studios had actors under contract and could decide billing. 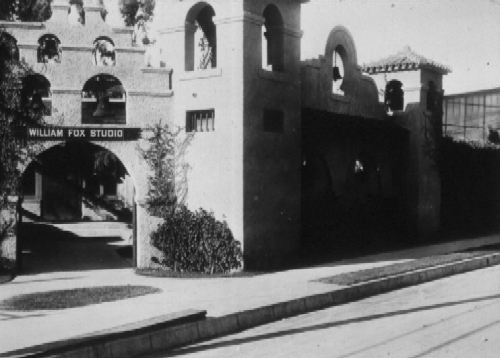 The studios still followed the billing system of the silent era. The following table shows those films, in order of release date, which John Wayne was probably involved with. 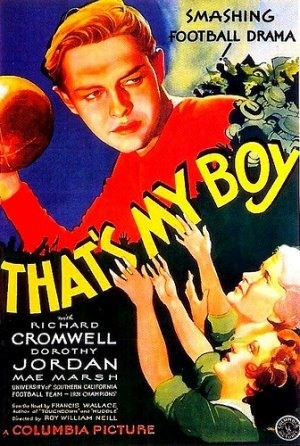 Where it is stated “Not credited on screen” it is meant that the film has been viewed, but that John Wayne’s name is not shown in the opening or closing credits. Where it is stated “to be confirmed” this only means that to date this film has not been viewed. Entries marked in RED have not viewed by or held in the collections of the author. Entries marked with *** indicates there are further notes for these films following the table. VI. This film has been viewed by the authors, however the quality is so poor that we were unable to say if John Wayne can be seen in this film or not. We were able to establish that John Wayne’s name does not appear in the opening or closing credits of this film. I. 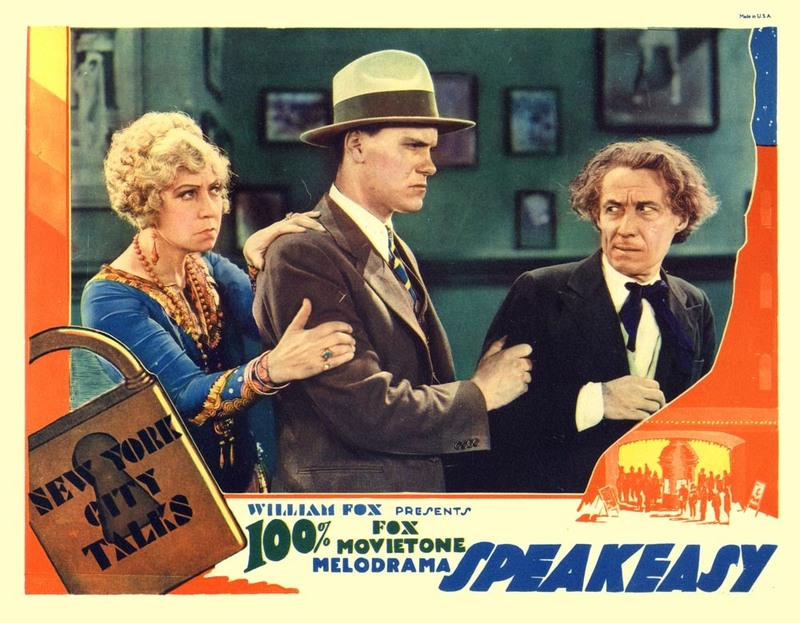 A Lloyd ‘Ham’ Hamilton comedy short released 7 February 1926. II. “He propped the film, and that was it.” Page 614 (Although the book contradicts this in its own filmography, which says he played an extra Page 7014). II. “According to Wayne’s recollection, … “I was hired on as an assistant for a George O’Brien western (I was actually hired as an actor but it was understood I would act as an Assistant – a scrounger, today they would call them a location manager). One of my jobs was to get 400 head of cattle into Blue Canyon which was 150 miles from any paved road. A preacher who had a little church on the Hopi reservation agreed to help me gather them. In gathering those cattle, we horse backed into Monument Valley. … It was during the making of this picture, in which I was assistant as well as riding in the posse that I personally rode through Monument Valley.” (The film was Lone Star Ranger, Fox 1930.) Volume VI, No 1, June 1989.9 This is noteworthy not simply because it definitively places Wayne in this film, but it also dispels two myths that have been perpetuated by many over the years. The first is that Wayne was never a cowboy. That he drove 400 head of cattle over 100 miles, while on horseback, proves that at least once in his life he was a cowboy. The second is that John Ford “discovered” Monument Valley, since Wayne was there almost ten full years before Ford filmed Stagecoach there in 1939. III. This film has been viewed by the authors, however the quality is so poor that we were only able to say that this is could be John Wayne seen in this film. We were able to establish that John Wayne’s name does not appear in the opening or closing credits of this film. VIII. This film has been viewed by the authors, however the quality is so poor and some reels are missing so that we were only able to say that this could be John Wayne seen in this film. We were able to establish that John Wayne’s name does not appear in the opening credits of this film. V. This film has been viewed by the authors, however, we were unable to say if John Wayne can be seen in this film or not. We were able to establish that John Wayne’s name does not appear in the opening or closing credits of this film. II. Monogram was well known for its low production values, and often utilized footage from other films that it produced. John Wayne made 14 films for Monogram between 1933 and 1935, including The Dawn Rider (1935), clips of which were used in The Painted Trail. 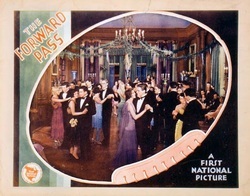 It is likely that footage from other films Wayne made for Monogram was used in the production of The Painted Trail as well. I. To the best of our knowledge this film no longer exists today. However, at least one still from the film does, and it clearly shows a very young John Wayne (known as Duke Morrison at that time) as a background extra. I. This film is available on home DVD, and a print exists in the archives of the Museum of Modern Art. II. John Wayne appears briefly in a crowd scene near the end of the film. From the expression on his face, one might come to the conclusion that he suddenly realized that he was on camera and in a place where he was not supposed to be. Be that as it may, however, he can still be clearly seen on film. V. This film has been viewed by the authors, however the quality is so poor that we were unable to say if John Wayne can be seen in this film or not. We were able to establish that John Wayne’s name does not appear in the opening or closing credits of this film. 1 Shepherd, Donald and Slatzer, Robert with Grayson, Dave. Duke the Life and times of John Wayne, Sphere books UK, 1986. ISBN 0751507814. 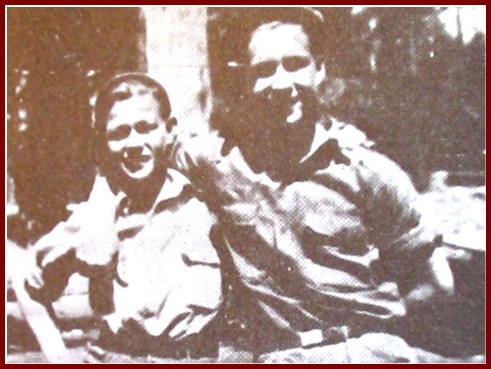 Donald Shepherd, Robert Slatzer and Dave Grayson were all personal friends of John Wayne. Slatzer (as Robert F Slatzer) was the director of No Substitute for victory, a documentary in which John Wayne was the narrator. Dave Grayson, as John Wayne’s personal make up artist was on set with Duke for every film he made in the last 15 years of his life. Mr. Grayson kept extensive journals, which together with his personal recollections, were used in this book. 2 Landesman, Fred. The John Wayne Filmography, McFarland & Company, Inc., 2007. ISBN 0786432527. 3 Eyles, Allen. John Wayne and the Movies, A. S. Barnes, 1976. ISBN 9780498014499. 4 Roberts, Randy and Olson, James S. John Wayne American, Free Press, 1995. ISBN 9780029238370. 9 Lilley, Tim. Author: Trail Beyond, an annual publication on the films of John Wayne and The Big Trail a bi-monthly newsletter dedicated to the films of John Wayne, published 1984 – 1999 by Tim Lilley, Akron, Ohio. 14 "Hollywood, the Early Years. The Young Duke, Wayne before Stagecoach" Video documentary "produced for Wonderland Entertainment Ltd. by E.P.A. International". (c) 1991 E.P.A. International Distributors Ltd. Narrated and hosted by Bob Sessions. 29 Elliott, The Duke - America’s Royalty. Glendale Evening Press, June 11, 1979. 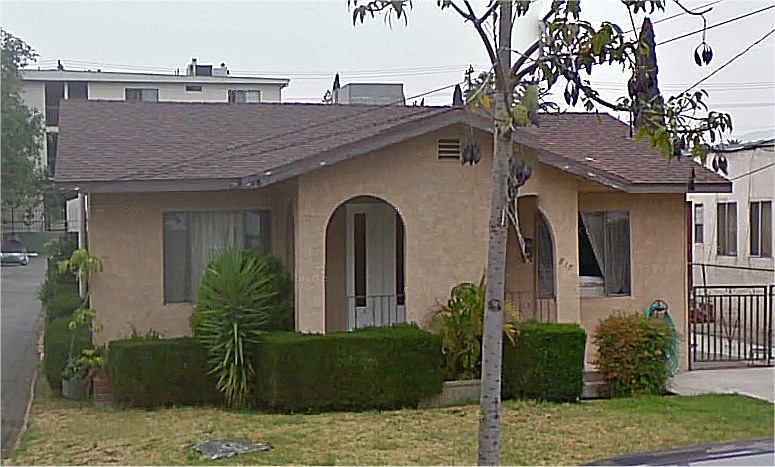 421 South Isabel as it appears today. 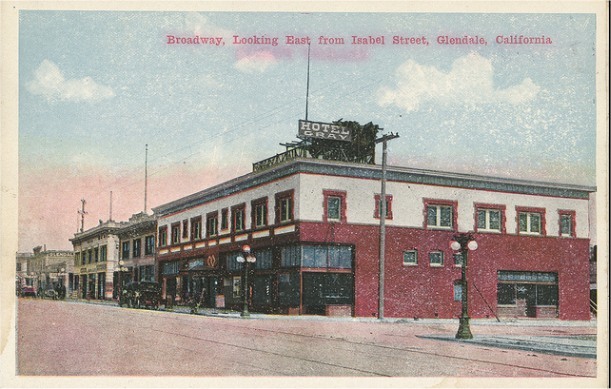 The Hotel Glendale. 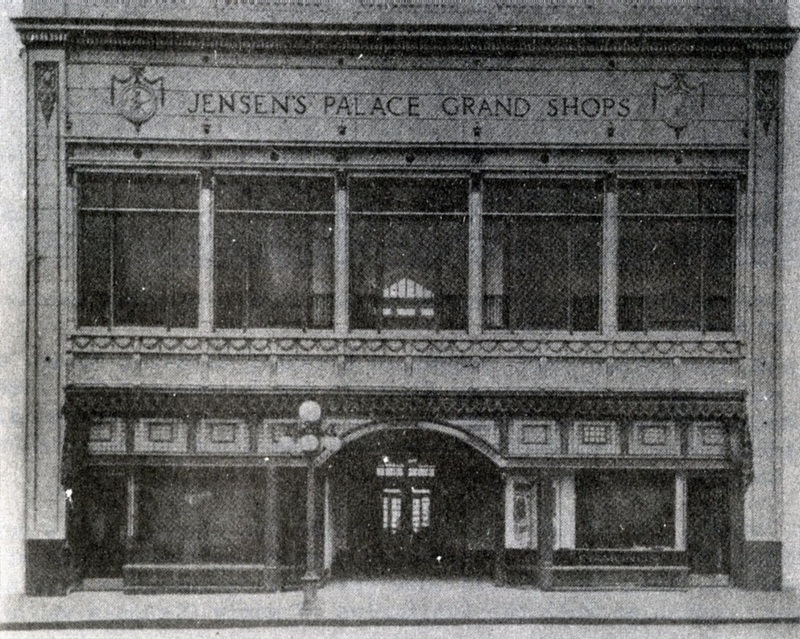 This building also housed the Glendale Pharmacy where Clyde Morrison worked. The family lived in an apartment above the pharmacy. 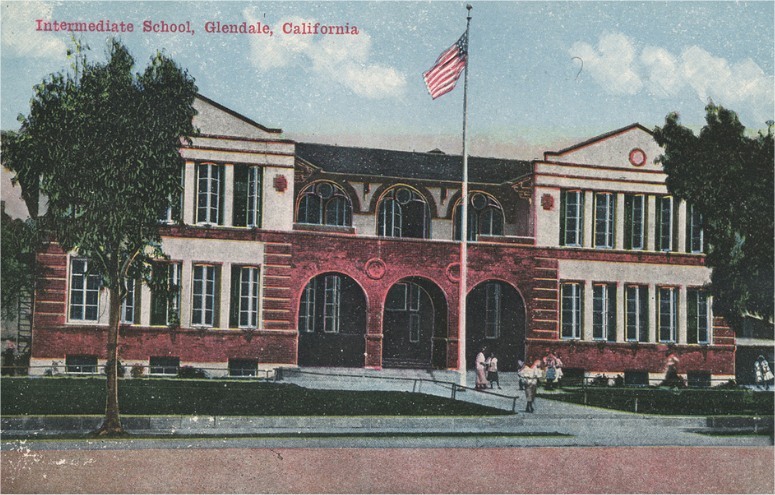 1921 – 1925 Glendale Union High school, Harvard Street and 1440 Broadway Avenue East, Glendale, Los Angeles County, California. 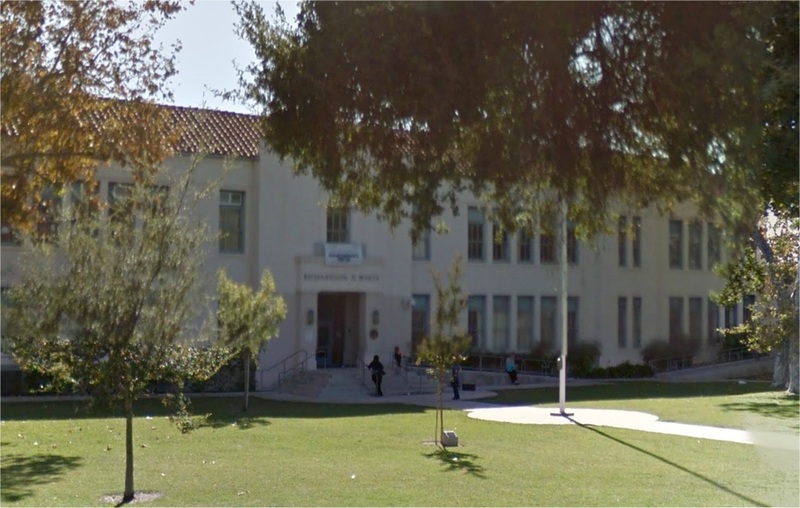 The Harvard Street School continued to operate until 1937, At Broadway and Verdugo, the first high school classes met in 1924. Entered as a freshman. Page 4414 Graduated May 1925. 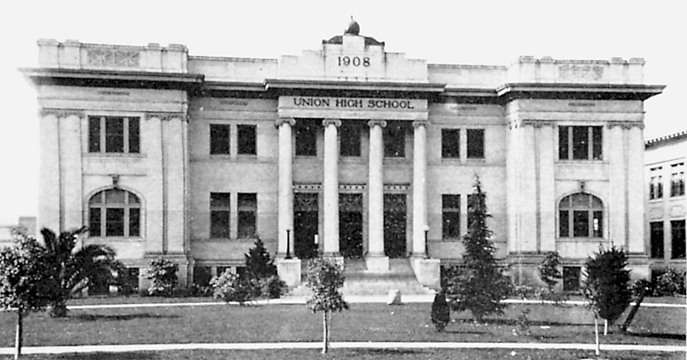 Wilson Intermediate School circa 1915-1925, as it appeared when young John Wayne attended school there. 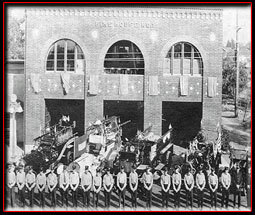 Glendale Union High School circa 1920's, as it appeared when John Wayne attended. 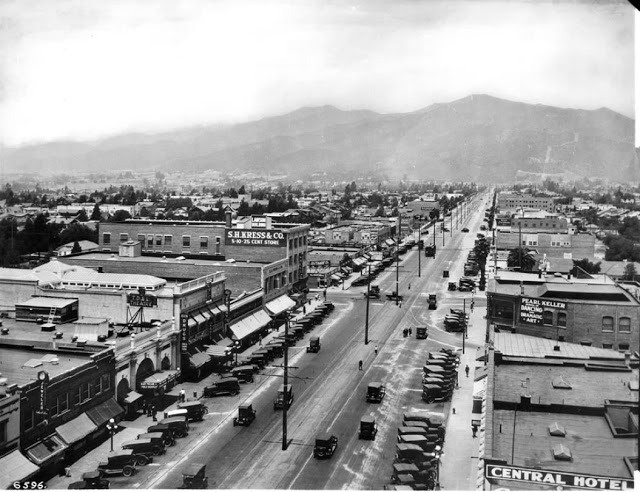 Looking down Broadway Avenue in Glendale in 1918. 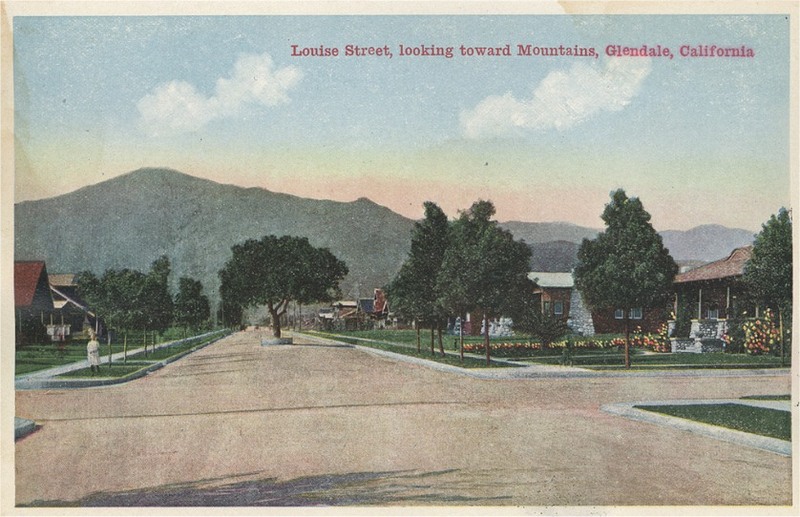 Glendale Union High can be seen on the left side of the street in the distance. 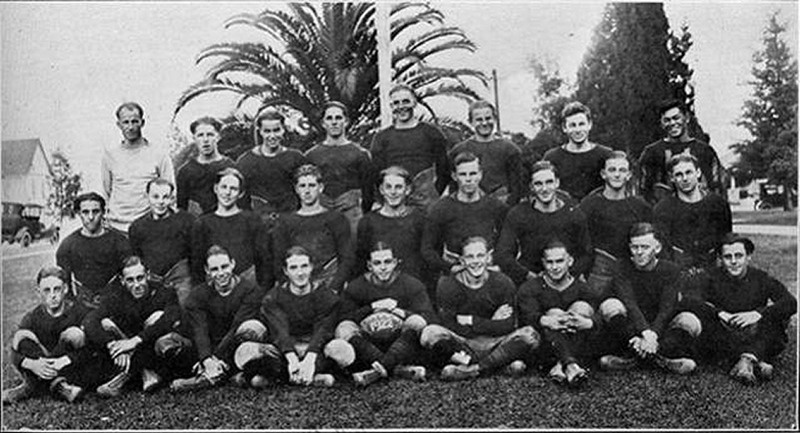 The 1922 Glendale Union High School Football Team. 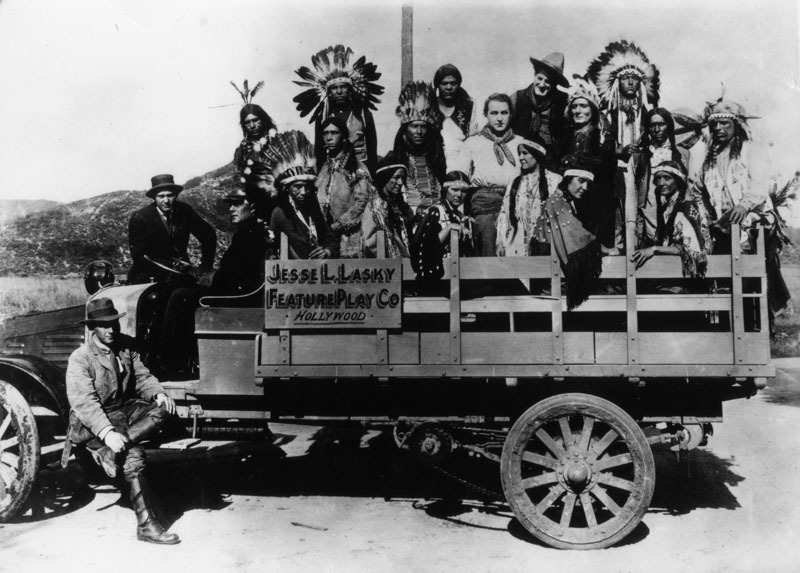 A very young John Wayne is middle row, second from right. 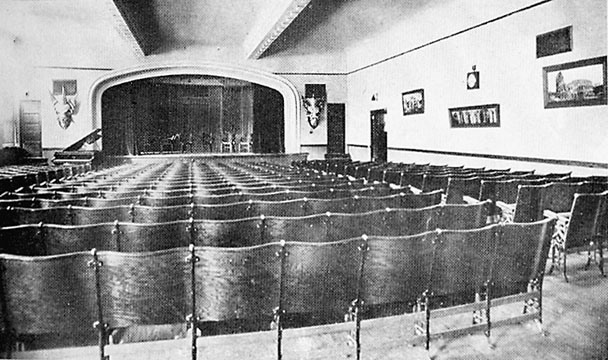 The auditorium and stage at Glendale Union High School. It was this stage that a young John Wayne appeared in school productions. 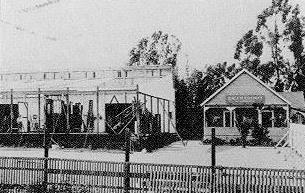 Baird & Echols Pharmacy, located at the corner of Brand Blvd and Broadway in Glendale (100-102 East Broadway). Clyde Morrison worked here. Page 2915 John Wayne also worked here delivering prescriptions. Believed to be on the corner of Brand Blvd and Broadway in Glendale. 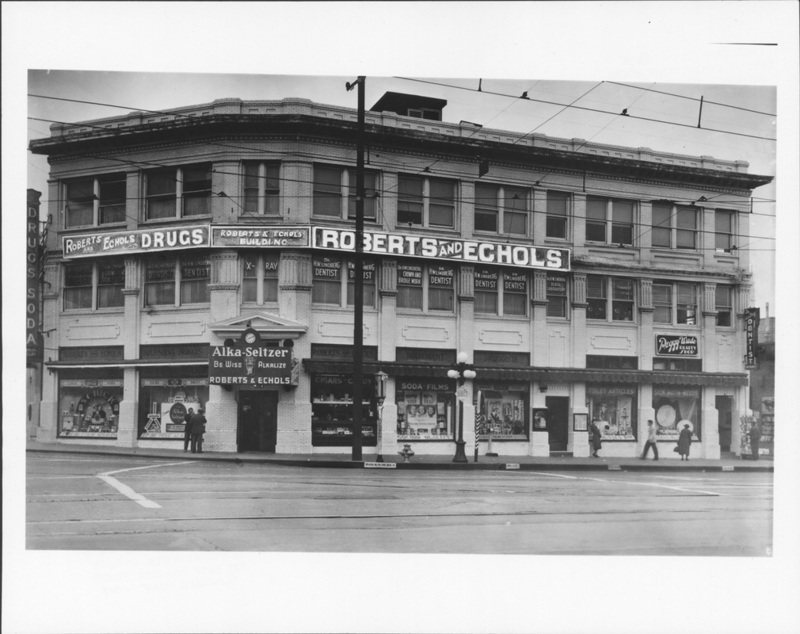 The building was likely the Roberts and Echols building, which housed the Roberts & Echols Pharmacy. This pharmacy later became the Baird & Echols Pharmacy and then the Baird and Morrison Pharmacy after Clyde became a partner in the concern. 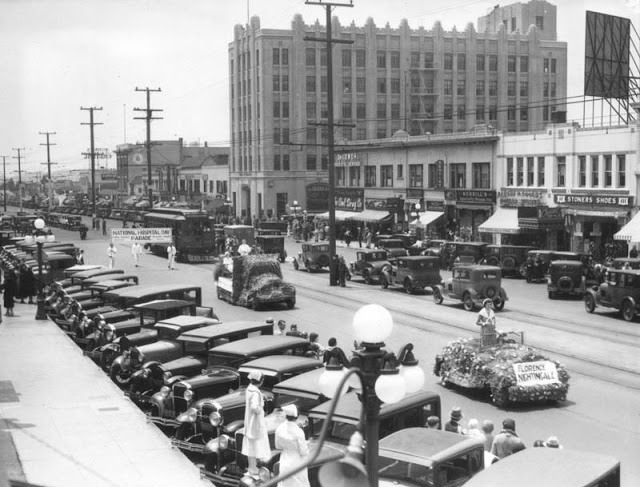 The building was later torn down in the early 1960’s and a new six-story building was erected. Roberts & Echols Pharmacy. 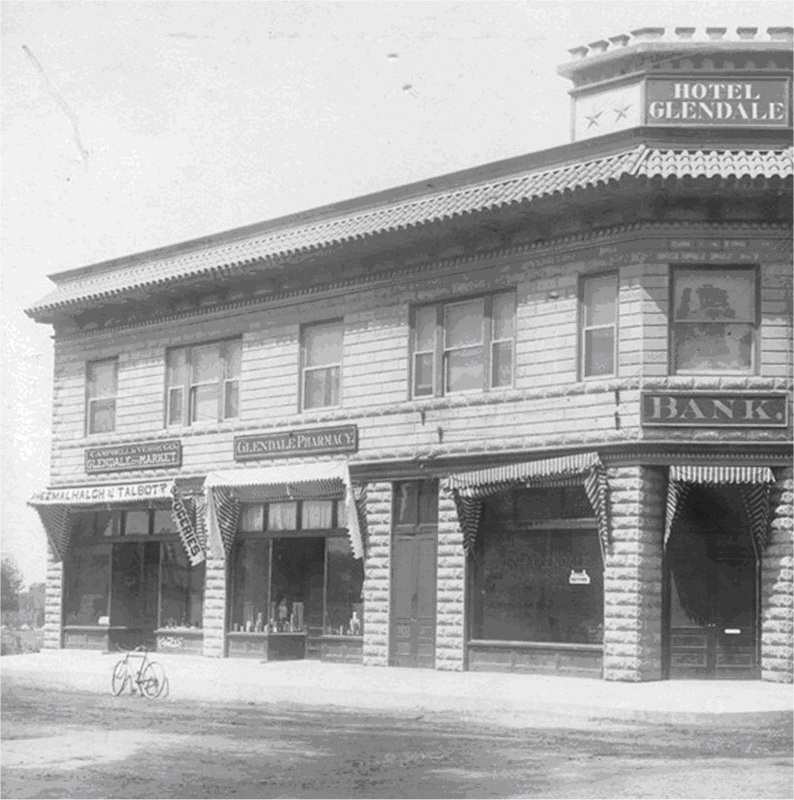 This same building can be seen in the 1915 view of Glendale located at the top of this page. 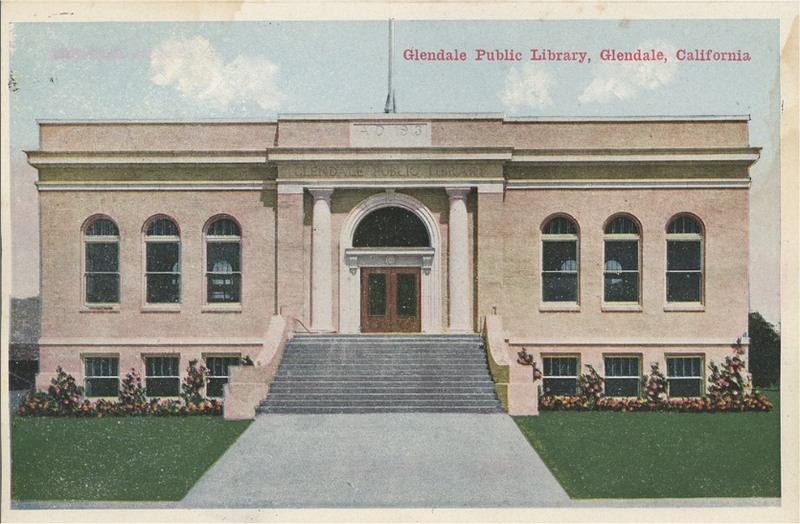 Glendale Public Library. 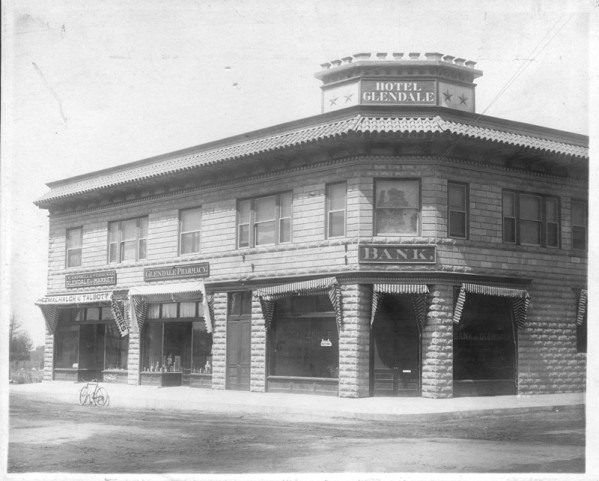 A young John Wayne spent many hours here reading adventure stories, biographies, histories and more. He maintained his love of reading throughout his life. Brand Blvd. 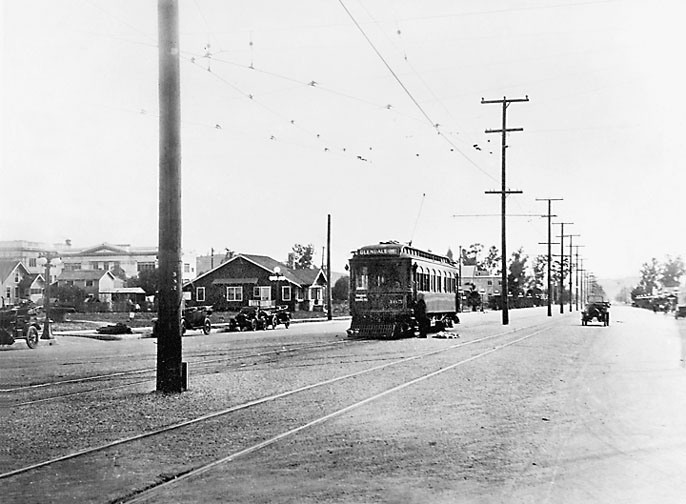 Glendale during the 1920's. With this parade happening, there is a good chance that a young John Wayne was somewhere watching this very same parade. 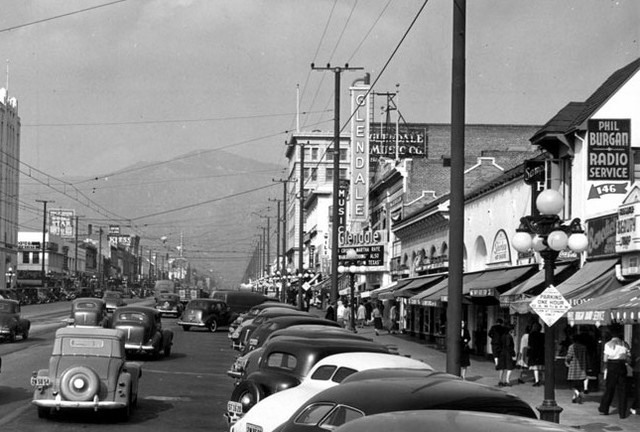 A view of downtown Glendale looking east from Isabel street, the same street that John Wayne lived on, and this then, is the same view he had at that time. 2. Certificate of birth record on file which states: Place of birth: Winterset, Madison County, Iowa, Full name of child: Marion Robert Morrison, Date of birth: 26 May 1907, Father: Clyde Morrison, Mother: Mary A. Morrison, Date of filing 31 December 1907. 3. 1920 Federal Census US. 4. WWI Draft Registration card signed by Clyde 1917. 5. 1910 Federal census Earlham, Madison Township, Madison County, Iowa. 6. 1915 Glendale city directory. 7. 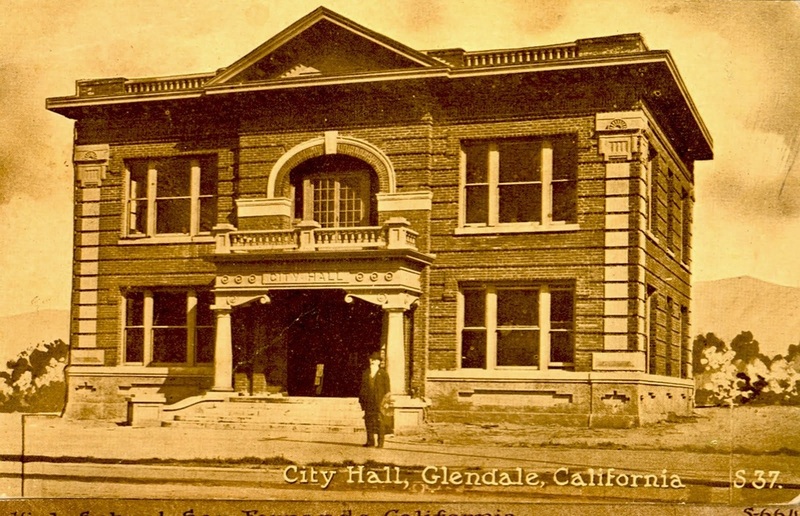 1916 Glendale voters register at 315 Geneva Street. 8. 1920 Glendale voters register at 815 South central. 9. 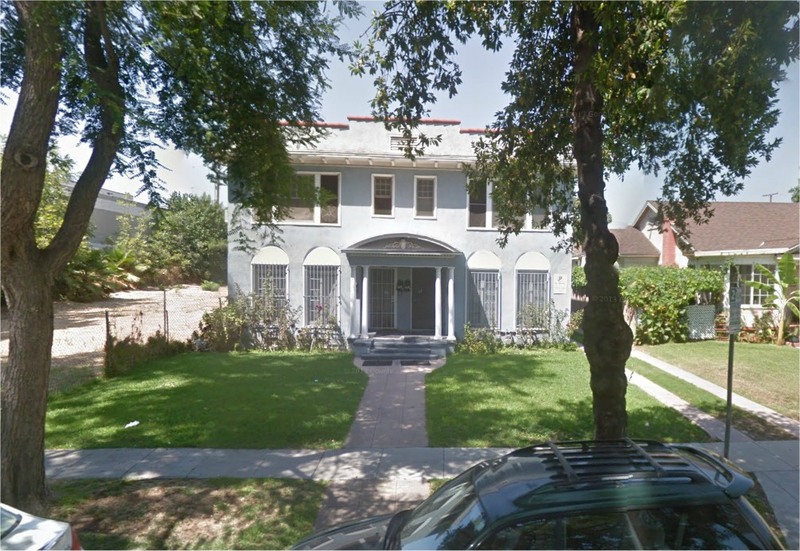 1922 and 1923 Glendale voters register at 129 S Kenwood Street. 10. 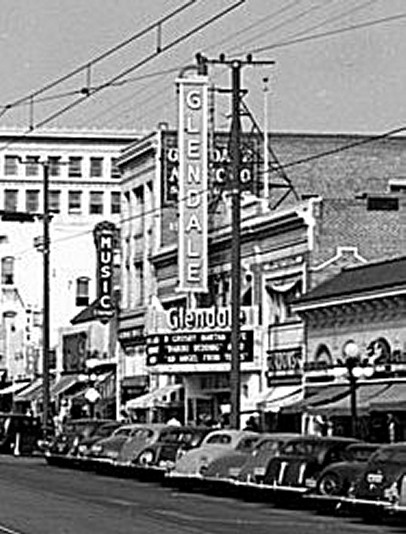 1924 Glendale voters register at 245 S Orange Street. 11. Elliott, The Duke - America’s Royalty, Glendale Evening Press, June 11, 1979. 12. John Wayne, It Happened Like This, American Weekly, November 7, 1954. 13. Landesman, Fred. The John Wayne Filmography, McFarland & Company, Inc., 2007. ISBN 0786432527. 14. Roberts, Randy and Olson, James S. John Wayne American, Free Press, 1995. ISBN 9780029238370.